I am the forest advisor for the two most northern coastal counties. A typical day for me 1) involves answering a few public informational calls, 2) working on answering important research questions that respond to the needs of a large and diverse group of private, public and tribal landowners and managers and 3) helping to provide educational opporutunities that help provide the most current and up-to-date scientific information. A typical day for me involves some time in the forests, time on the phone, and time working with people on their forests or ranches. This year I had the opportunity to interview 10 people who have been touched by Cooperative Extension over the years. I was greatly moved to hear their personal stories of the types of impact our organization has had in their lives. 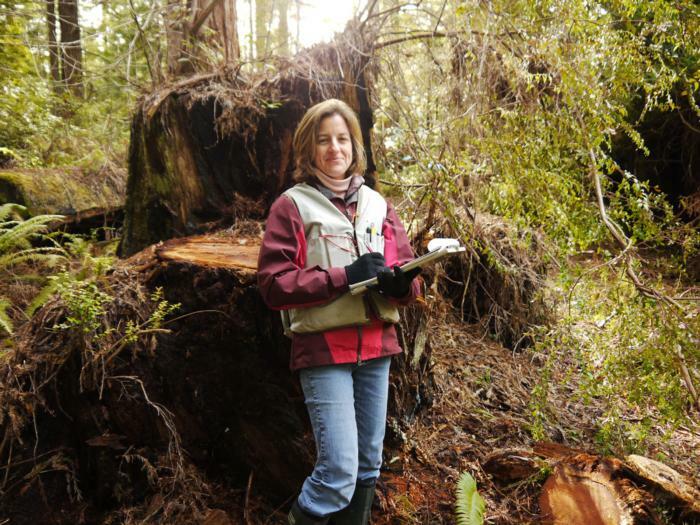 The impacts ranged from giving them skills for life or providing information that changed their agricultural practices.Personal notable accomplishments include 1) substantially advancing the field of forest disease management in the north coast, including addressing forest fuels in the face of sudden oak death, 2) helping change forest policies to provide more opportunities for forest landowners to manage their lands and 3) connecting people to ideas, information (and sometimes) financial resources so that people can help achieve their goals. Helping people is what I love the most. I am challenged every day to learn new information. This is a very stimulating environment to work in. Everyone we work with is so appreciative of what we have to offer. Two colleagues told me about UCCE. I the started collaborating with the organization. A job opened shortly there after and I applied and was hired.